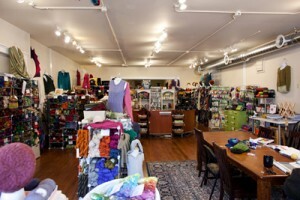 The Fiber Gallery has been serving Seattle knitters and crocheters since 2004. We are located in the eclectic Phinneywood neighborhood, minutes from I-5 and Highway 99 in the northwest part of the city. Get directions. Learn more about our community. Felters will appreciate our raw fiber and needle-felting accessories. We also stock a large selection of needles, books, bags and other accessories. Spinners can find spindles from Schacht. For those who want an introduction to weaving, we carry Cricket 10-inch and 15-inch table looms, School Looms and more!